Prague attracts visitors from all over the world. The medieval city centre and the Czech beer, the fascinating history surrounding the castle and the hustle and bustle in the traditional pubs – the city has something to offer for every generation and every budget. 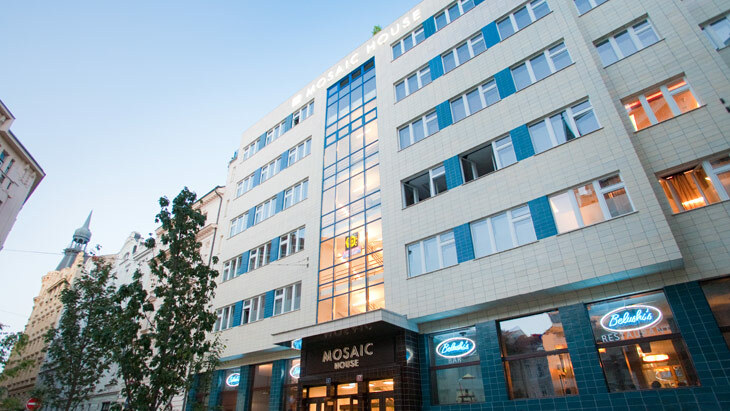 The Mosaic House hotel shows that even in Prague, time does not stand still. It not only has a trendy design, but also makes a highly modern contribution to resource conservation. With the vibrant old town behind it and views out on to Prague castle, the Mosaic House is close to the Vltava and the old town. The old 1930s building has been renovated and extended to create a combination of a 4-star hotel and a modern hostel. The balance between individual tourism and backpackers, who are perfectly happy to check into dormitories, was an instant success. Also widely recognised is the successful combination of a fresh design with a far-reaching environmental protection concept which Hansgrohe SE helped create. The shower water used by up to 236 guests, which averages out over a year at nine cubic meters per day, flows through the Pontos AquaCycle 6000HC* grey water recycling system. This reused process water is then used to flush the toilets throughout the building. Also installed: the Pontos HeatCycle*. This system recovers the heat from the waste water and uses it to heat up fresh shower water. It enables the Mosaic House in Prague to reduce its energy needs for the provision of hot water by 20% – while also reducing its CO2 emissions. And where is the mosaic? According to the hotel operator, this represents the broad range of guests and their needs – but can also be found both on the facades and in the bathrooms. * All systems were planned and constructed on a customised basis.